Around this time of year, we like to find just the right artist for our October feature. Chris Raimo was just the one to deliver a fun and spooky Halloween-themed image. Chris has contributed to PixArt before in a few of our annual call-to-artists. Most recently he was a stand-out in our Monsters Mash-Up celebration, combing the world of Monsters University with the characters from UP. Chris is no stranger to things that go bump in the night. One look at his websites and you’ll see just how much this talented guy digs Halloween. 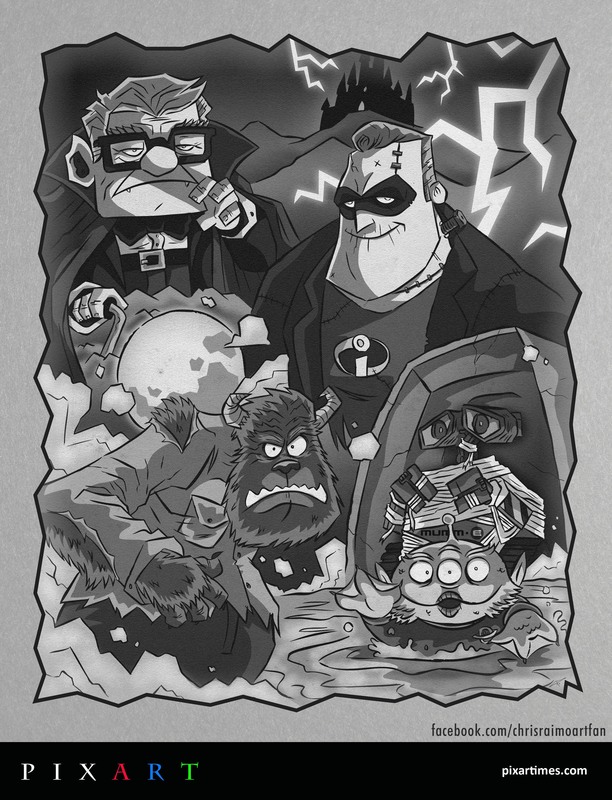 His portfolio is populated with all sorts of pop culture creatures – including some fun Pixar pieces. And if you’re a fan of Disney’s Haunted Mansion, you will definitely have to check out his Facebook fan page The Art of The Haunted Mansion. Our thanks to Chris for contributing this fantastic mash-up of some of Pixar’s most famous characters with the classic Monsters of cinema. Read on for more about Chris in his own words! Woody and Buzz are my top two. The first thing that popped in my head when thinking Pixar and Halloween was to mash up Pixar characters with the classic Universal Monsters (Frankenstein, Dracula, Wolfman, The Mummy, and Creature from the Black Lagoon.) Then it became, “Well who would be who?” and as I started to think about it everything started to fall into place. I’m a HUGE fan of vintage black and white horror movies and wanted to replicate that dramatic style and shadows. I have to recommend visiting Disney World – there’s always something there that inspires me. Also watch any of the Youtube docs on Disney history and John Lasseter. If you’d like to be considered for a PixArt feature here send us a link to your portfolio for consideration. Contact Us today! View all previous PixArt pieces here. Jerrod Maruyama is a freelance illustrator currently residing in Sacramento, CA. His passions include character design, animated films, Disneyland and all things cute. For more about Jerrod, visit his website here.